Discover your perfect FAMILY GETAWAY when you vacation at Lippe Lodge! Conveniently located on the West Shore, you have easy access to SEVERAL BEACHES, 4 downhill ski mountains, several cross-country ski trails and sledding hills - all within 5 - 30 minutes. With only a 10-minute walk to the beach and local restaurants and a 2-mile drive to Tahoe City (great bike ride! ), our home is easy to find in the mountain-town neighborhood of Pineland and it's easy to get to when everything is covered in snow. For golf lovers, rejoice in knowing you're just minutes away from several championship golf courses. Located super close to Sunnyside Resort. An unexpected EXTRA (and not found in just any vacation home) is our GAME ROOM. Located on the Upper Level, the inviting, comfortable Game Room is equipped with a full-size pool table, a bistro table & stools, 2 over-stuffed sofas, a large flat screen TV with DVD player, DVD's, board games, play area, a full bathroom and a deck at each end. This is the perfect gathering spot after a big day of skiing or snowboarding or after a full day at the beach or on the boat! The FAMILY ROOM is on the Lower Level and is directly adjacent to the Kitchen and Dining Room. The expansive sectional sofa surrounds the Family Room allowing you to relax and enjoy the cozy flames of the gas-burning fireplace, to daydream out the large sliding glass doors or to get under a cozy blanket and watch your favorite old movie on the large TV. Enjoy meals or libations outside on our OVERSIZED DECK! Complete with table, umbrella, director's chairs and Adirondeck chairs, there's plenty of room for everyone. The kids will love setting out on an adventure in the LARGE YARD AREA and everyone can enjoy playing a game of horse shoes at the horse shoes pit or roasting marshmallows at the fire pit! The outdoor HOT TUB is built into the deck and seats 6 people. PETS are welcome, too (fee applies - see below). Please include the number of pets in the "Pets" field of the quotation window. If you care enough to bring your pet on your vacation in our home, then we know you've house-trained them! Our neighborhood, and the area in general, is very dog friendly! Hurricane Bay is a dog-friendly beach that is just 1 mile away from Sunnyside Beach. We do ask that you are diligent about cleaning up after your pet in the yard! PETS MAY NOT BE LEFT ALONE INSIDE THE HOUSE, UNLESS CRATED. BEDROOMS are located on the Lower Level (2) and the Upper Level (2). The Lower Level Bedrooms both have queen beds. There is also a queen pull-out in the sectional sofa in the Family Room, allowing the Lower Level to sleep 6 people. In the Upper Level, 1 bedroom has a King Bed and a Twin Day Bed and the 2nd Bedroom has a Queen Bed and a Twin Bed. There is also an alcove area that has a Twin Day Bed, allowing the Upper Level to sleep 7 people. All TOTAL, Lippe Lodge can sleep 13 people very comfortably! Please note that there is a $25 charge plus tax per person over 10 people and this is not calculated in the quote. BATHROOMS: 1 full Bathroom is on the Lower Level (with tub & shower), and 2 full Bathrooms are on the Upper Level (1 with tub & shower and 1 with just shower). KITCHEN/DINING ROOM: The fully stocked Kitchen has everything! All major appliances, coffee maker, toaster, blender, pots/pans, dishes, glassware, flatware....you name it, it's there! The gas stove top is built into the bar area, which makes it nice for more than one person to be helping in the Kitchen, and there's room for 3 people to sit at stools at the bar. The Dining Room table has chairs to seat 6 people, but there's space to pull up stools or extra chairs to seat more. Some LOCALS' RECOMMENDATIONS: Hit the Bridge Tender or Rosie's Cafe for some apres ski action, go ice skating at Northstar or take the Gondola to the top of the mountain at Squaw! Walk to the Firesign Cafe for breakfast or lunch. In Summer, enjoy lunch or dinner on the deck overlooking Lake Tahoe at Sunnyside Resort. Go to the Free Concerts at Commons Beach on Sunday (bring a picnic). The best to-go sandwiches are at the PDQ Market in Tahoma. Get great coffee and pastries at Tahoe House (ride your bike). Ride or walk the bike path from home to Squaw Valley. Tube the Truckee River to River Ranch and have an ice cream (some tubes available at the house)! Enjoy! General Layout: LOWER LEVEL - 2 Bedrooms, 1 Bathroom, Living Room, Kitchen, Dining Room. UPPER LEVEL - 2 Bedrooms, 1 Alcove with Day Bed, 2 Bathrooms, Game Room. * Add $25 per person per night over 10 ppl. * Add $75 per pet (maximum 2) for 1 - 3 night stays. * Add $120 per pet (maximum 2) for 4+ night stays. * Rates and minimum night stay requirements may vary over holidays/periods. Very neat and clean with all that was stated in the VRBO site. Everything we needed was there. Fully stocked with all very nice pots and pans, utensils, towels etc. It was as if the family had stepped away and we were their guests. We truly could have just taken our clothes and food. Very comfortable home. Lippe Lodge is a wonderful place to stay! From the moment first requested an opportunity to visit Lippe Lodge, we felt like cherished guests. Rob, his family, and Melanie took great efforts to make sure we felt welcome and to make sure the home was ready. The heat was turned up to make our arrival more comfortable, and we found a handwritten note and some treats on the dining room table that made our arrival that much more welcoming. The home itself is well decorated, easily slept our crew of five, the home can easily accomodate far more guests. Of special mention, the kitchen is extremely well furnished and had EVERYTHING we could possibly need. Not only that, but the utensils were very high quality! You could very easily host a holiday gathering at Lippe Lodge. 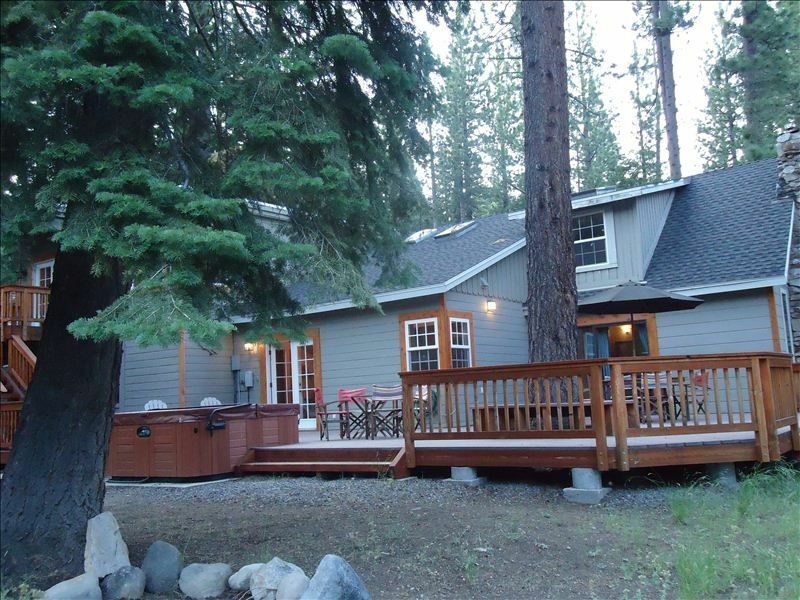 While the Tahoe area offers a wealth of activities, we also found plenty to do in and around the home including billiards in the game room, board games, and we enjoyed horse shoes in the yard. We can’t wait to visit Lippe Lodge again! Really great stay... we had a full house of people (10-13ppl) and we had plenty of room. Spa was great, horseshoes in the front yard was also a lot of fun. Great location and great stay. Great house, great location! We’ll be back ! We had a wonderful week at the Lippe Lodge! The house is spacious and cozy. The deck and hottub are wonderful. Our children and grandchildren thoroughly enjoyed it. We always love the location which is close to the beach and restaurants! Thank you Melanie for sharing your home with us! Pet fee is $75.00 per pet (maximum of 2) for 1 - 3 night stays. Pet fee is $200.00 per pet (maximum of 2) for 4+ night stays. Additional $200 pet damage deposit required (refundable).